The ICD-10-CM Expert for SNF, IRF and Inpatient Hospice with our hallmark features and format makes facing the challenge of accurate diagnosis coding easier. 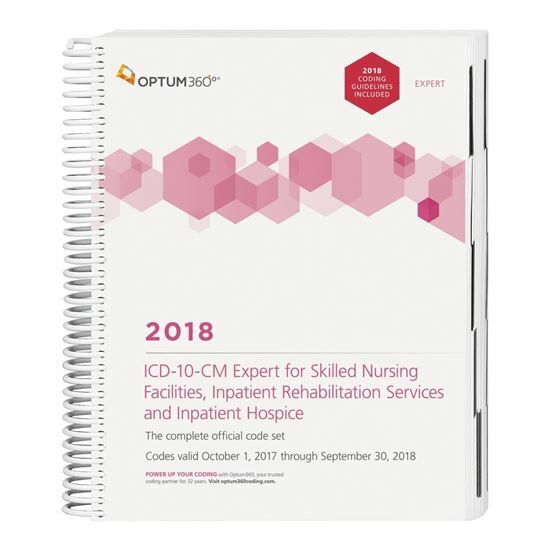 Use the code book that contains the complete ICD-10-CM code set and the familiar Optum360 coding and reimbursement alerts for SNF, IRF and hospice including: color-coding and symbols identifying diagnoses for RUG IV, IRF RIC, hospice non-cancer conditions and non-routine supplies. Delivery Option 2: Updated 2018 coding guidelines bound in the book; delivery before October 1, 2017 is dependent on when the updated coding guidelines are released. Delivery may be delayed beyond the October 1, 2017 effective date. • Optum360 Edge — Supplementary appendixes. Additional coding and reimbursement information covering PPS for SNF, IRF and hospice services; Medicare coverage; quality initiatives; and long-term care guidelines and coding examples are located in supplementary appendixes. • Optum360 Edge — Case Mix Quick Pick Cards. These handy 8.5” x 11” laminated cards identify diagnoses included in Resource Utilization Groups (RUG) IV, IRF Rehabilitation Impairment Categories (RIC), hospice non-cancer conditions, and non-routine supplies.